Are you looking for a recipe to make your life easier? Turn your favorite crock pot meals into a one-pot meal with this yummy Crock Pot Potato Packet! This is a recipe to make your own. If you want mashed potatoes, make them up into mashed potatoes. If you want creek potatoes, you can eat them like that. If you want to add bacon, add bacon! Whatever you want, go for it! 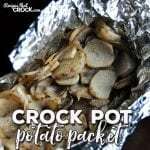 This Crock Pot Potato Packet is an add on recipe. You will be placing the packet in the same crock pot as a meat you are cooking for 6-8 hours. It makes it so you can make your main dish and side dish all in one crock pot! That way you only have to have or clean up one crock pot instead of two!